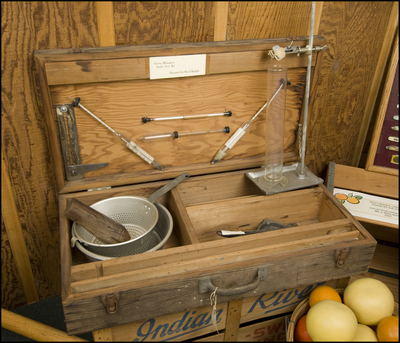 Vero Citrus Test Kit (artifact image), from A History of Central Florida: Podcast, Episode 38: Citrus Industry. Episode 38 features Florida's citrus industry and related artifacts at the Indian River Citrus Museum in Vero Beach and the Winter Garden Heritage Museum in Winter Garden. "Vero Citrus Test Kit" (2014). All Museum Images. Image 350.